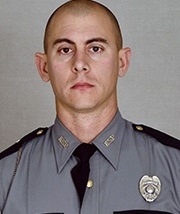 Trooper Joseph Cameron Ponder of the Kentucky State Police was shot “multiple” times late last night and died a short time later at Caldwell Medical Center in Princeton, Ky., state police said. Ponder, 31, a rookie who’d graduated from the Academy in January 2015, was stationed at Post 1, Mayfield. He was assigned to Trigg County. Police identified Joseph Thomas Johnson-Shanks, 25, of Missouri, as the alleged assailant. The incident began with a traffic stop near the 58-mile marker westbound on I-24 at about 10:20 P.M CST yesterday, police said. A nine-mile chase ensued after the suspect vehicle fled, police said. After making contact with the driver, the vehicle fled from the stop. A pursuit ensued with the suspect stopping abruptly around the 49 mile marker, causing the front of Trooper Ponder’s police cruiser to make contact with the rear of the suspect vehicle. At this time, the driver of the suspect vehicle fired several shots into the police cruiser striking the hood, windshield and Trooper Ponder multiple times. The suspect fled the scene on foot. Police found Johnson-Shanks in a wooded area near I-24 at about 7 a.m. today.